RANTING ANDY – I typically write the most when angered, and today takes the cake on that front (actually, tied with about 20 other days since “Phase 2” of Cartel manipulation commenced on November 9, 2010). To start, I want to follow up what I wrote this weekend to show that what have predicted occurred EXACTLY as described. Last March, Andrew McGuire’s warning were afforded much attention (at least in hindsight), but I fear mine will not. Oh well, as long as my readers are aware of what is happening in the rigged PM markets. Let’s start with Tuesday, i.e. YESTERDAY. As a prelude, if you remember this weekend, you’ll recall that it started with gold rising $15 on Friday (to $1,536/oz), despite having been stopped cold at EXACTLY 12:00 PM EST, as usual. Just take a look at the chart below again, not only for Friday the 27th, but also the two preceding days. Again, the unending choppiness is the result of non-stop Cartel naked shorting of PAPER GLD and COMEX futures contracts. Irrespective, on ALL THREE DAYS gold fought through that shorting, and had commenced sharp moves upward when TPTB stepped in at EXACTLY 12:00 PM EST to quell the rallies, in each case at the 1% DAILY CAP that has defined COMEX gold trading for 99% of all trading days over the past decade. And regarding that choppiness, take a look at the HUI, which just since the beginning of the year has had drops of 18%, 11%, and 19% (not including today’s attack), despite the fact that gold (below) is up 9% for the year and silver 21%, INCLUDING the SUNDAY NIGHT PAPER SILVER MASSACRE last month and today’s beauty of a late day paper attack (more on that later). 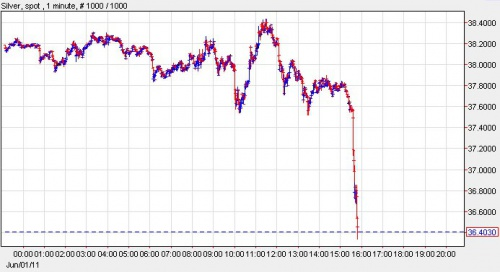 In fact, if you look at the gold chart below, you’ll see that it only declined 3% at the time of the Japanese earthquake (purely due to Cartel shorting to keep it from being viewed as a safe haven), and just 6% during the SUNDAY NIGHT PAPER SILVER MASSACRE. Despite those miniscule gold price drops, the Cartel’s “Phase 2” scheme of violently attacking the PM shares has been in full force. 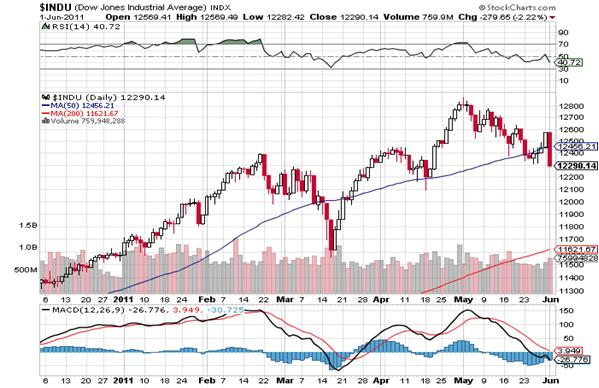 And not to mention, the PPT’s unending support of the Dow, which not only NEVER challenges its 200 DMA, even during times of economic collapse as we are seeing today, but is actually UP 6% for the year. Moreover, despite all the horrible worldwide economic news, the Dow has not been permitted to have a decline of more than 6%, and even that was directly after the Japanese earthquake, which CLEARLY is a massive negative for global business activity. OK, back to this week. First, take a look at Monday, Memorial Day, which is not a holiday anywhere else but in America (past three day charts below). The markets may be thin, but as you can see, the gold price went up with essentially no volatility, as Cartel members were at BBQ’s in the Hampton’s laughing at how stupid all the sheeple are for letting them take bailouts and steal by rigging the markets, together with their cohorts, or should I call them slaves, in Washington. Next, look at Tuesday’s action, i.e. yesterday. Per the commentary above, this weekend began with gold breaking MASSIVE Cartel resistance late on Friday afternoon at $1,530, and closing at $1,536. Then a weekend of riots in Spain and Greece, talks of new European bailouts, and essentially a non-stop docket of bullish gold news (ALL news is bullish gold news these days). In fact, as I woke on Tuesday morning, the dollar was down sharply, oil and other commodities were up sharply (even silver), and for some reason Dow futures were sharply higher. 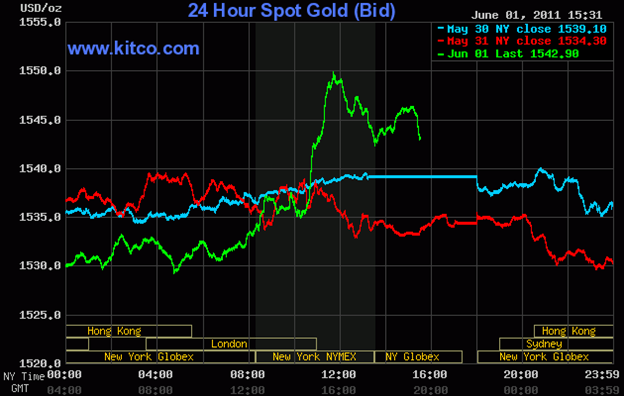 However, miraculously gold was unchanged and completely unresponsive to the across the board commodity surge. 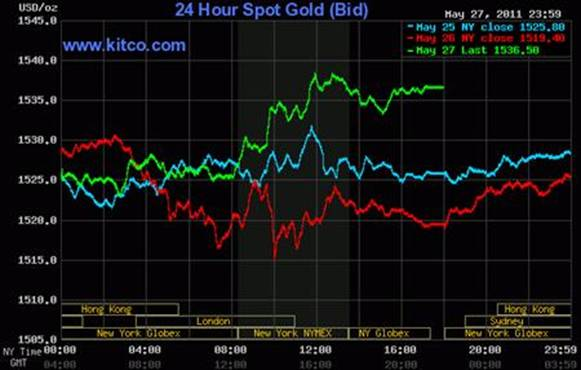 As I noted this weekend, the Cartel NEVER lets gold, silver, AND the stocks all go up sharply at once, and anyone who watched the HUI yesterday saw EXACTLY what I predicted, yet another strong open followed by fading all day while the Dow didn’t budge from its highs (it rarely does). And thus, the fears of a sharp PM rally were nicely quashed. Tuesday may have seemed like an “OK” day, as silver ended up $0.55 and the HUI was marginally positive, but neither came close to surpassing their early morning highs due to the Cartel capping, and with gold fighting to just stay flat while the HUI faded all day, once again perceptions and sentiment towards the group were beautifully massaged. But as irritating as yesterday was, today takes the cake (again, note the chart above). Gold didn’t move much while I was at the gym (5 am EST), but actually started to creep up, gaining a bit of steam after the BEYOND BELIEF HORRIFIC ADP jobs report at 8:15 am EST. It was then calmed down by Cartel selling right after the 8:20 open (what else is new? ), but EXPLODED higher following further INCOMPREHENSIBLY BAD ECONOMIC NEWS (ISM and construction spending). I mean, do they really pay people to predict these stupid numbers? Lo and behold, with the Dow down 150, gold up $15 to EXACTLY $1,550, and silver a few pennies from recouping its nonsensical early losses (that was CARTEL selling overnight in anticipation of the horrible economic data), the Cartel played every trick in their book, to quell enthusiasm for PMs. To start, now that $1,530 gold was finally broken (the Cartel’s “hard cap” rule, which it constantly holds at certain round numbers), a new hard cap had to be created. $1,540 was their target cap following the weekend’s typical Cartel strategy session, however thanks to the incredibly strong demand resulting from such massively bullish gold news (can you say QE3? ), gold sliced right through $1,540 and raced to $1,550. Obviously $1,550 is an immensely important number, as not only is it a particularly ROUND number, but is just a measly $25 from the ALL-TIME high set just a month ago before the SUNDAY NIGHT PAPER SILVER MASSACRE that has been touted as the end of the Precious Metals bubble. Moreover, the $15 rise represented an EXACTLY 1% price gain, which as noted in my last rant is the Cartel’s upper band for daily gold prices (remember Friday, UP $15?). So they dug in, and at guess what time? Yes, EXACTLY 12:00 PM, when gold was up EXACTLY 1%, just as I wrote just two days ago. Silver was stopped cold when it got to EXACTLY unchanged, as part of yet another aggravating, long-time Cartel rule which I long ago coined “DLITG”, or “Don’t let it turn green”. DLITG has been the Cartel’s insurance policy against key reversals in PM stocks for the past 5+ years, which if you haven’t noticed NEVER happen. If an early down day for the PMS’s (be it GLD, SLV, or the HUI) looks like it wants to reverse sharply to the upside, you can count on maniacal resistance at the unchanged mark, something I have observed since roughly 2006, which has never relented. And on cue today. And by the way, once more I implore you to take a look at the two charts above to see what happened to COMEX gold at EXACTLY 12:00 PM on the past four days. All four times, a major surge was stopped cold, as per what I have been writing. I don’t have the COMEX hour-only chart for all four days (just the 24-hour chart), but I certainly have the last two. Take a look at 12:00 PM EST on both, particularly today, and tell me if you think I’m not on to something. And PLEASE read what I wrote in my RANT from two days ago about 12:00 pm EST, while you are perusing these charts. In fact, I’ll do it for you, right in between them! And don’t forget to note that both hard caps occur EXACTLY at round numbers, in the former case at $1,540, and the latter at $1,550. THE NEVER- FAILING 12:00 PM EST END OF DAY CAPPING – This is one of the most damaging of all the Cartel tricks, but doesn’t get as much attention because it usual is a CAP, rather than the SMASHES that are more regular at 3:00 AM EST, 8:20 AM EST, and 10:00 AM EST. 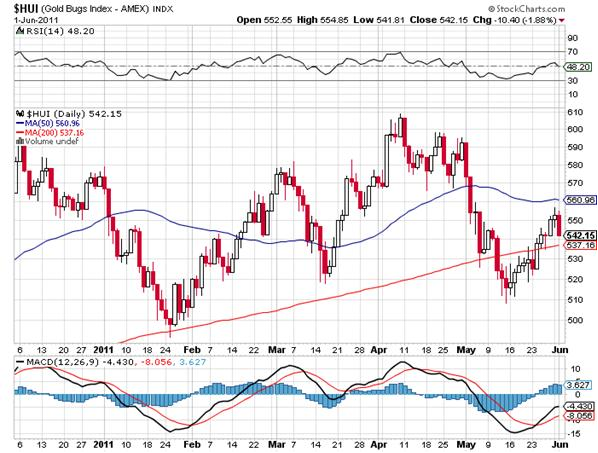 However, it is extremely integral to the Cartel strategy of never allowing material daily gains in gold, particularly late in the day because that might engender media attention and, more importantly, significant follow-up buying in Asia. Yes, today’s butchering at EXACTLY 12:00 pm EST, yet again, was out of extreme desperation, as the absolute #1 Cartel rule is to NEVER, EVER let PMs rise sharply (and thus be perceived as safe havens) in times of political, economic, or social chaos. Americans are simply NOT ALLOWED to see that gold is the preferred global investment in today’s world of economic depression, sovereign default, and currency collapse, at any cost! But alas, even with all the attacks, with just 20 minutes left in today’s NYSE trading day, the Dow was down 250 points with gold up $11, silver down just $0.50 (despite the intense Cartel naked shorting pressure), and the HUI just 4 points. Thus, they pulled out a NEW trick, a “bazooka” if you will, something that even I had never seen in nine years of watching this sector trade every day. And that was…..the LAST SECOND PAPER SILVER ANNIHALATION, a “negative Hail Mary”, if I may so describe it. Even for the Cartel, this one really took the cake, in that only a complete dolt couldn’t figure out that silver was not down due to “deflationary fears” (AHEM, gold ended the day UP $3, to $1,540), but due to a deliberate attempt to make sure the day ended with no commentary about a flight to safety in Precious Metals, PARTICULARLY silver which must be made to look like an “industrial metal” anytime weak economic data leads to declining commodity and prices (of course, the #1 industrial metal, COPPER, was barely down today). I have NEVER seen such a late HATCHET JOB on silver, or gold for that matter, EVER, as per below. And to the ungrateful e-mailer that questioned my faith in the PHYSICAL market, does that look like a decline in REAL SILVER demand to you? Do you believe ANY PHYSICAL SILVER, ANYWHERE IN THE WORLD, changed hands in the roughly FIVE MINUTES it took the Cartel to slam PAPER silver (SLV) by $1.30, or 3.5%, during a period when the Dow fell by essentially 5-10 points (I was watching)? And don’t forget this happened literally right before the NYSE closed, so as to create negative sentiment, and press, overnight (as if the Chinese are too stupid to figure it out). What I have repeatedly said is that you WILL NOT LOSE owning REAL, PHYSICAL METAL, but anything can happen in anything else, particularly if you hold trading positions in FAKE, PAPER securities like GLD and SLV. The purpose of this article was primarily to highlight the hard and fast RULES for watching the gold Cartel operate. My hope is that by reading these RANTS, you will not FEAR that “the PM market is telling you something.” It is NOT, this is the Gold Cartel desperately trying to keep you from panicking into Precious Metals, as we get closer and closer to the END GAME of a currency collapse, led by the U.S. dollar. Trust me, it will happen sooner rather than later, and if you don’t believe me, pray tell what you think will happen when QE2 ends later this month (actually, just three weeks until the Fed’s decision-making meeting). By then, I’d be shocked if something tragic hadn’t already happened in Europe (Greece, Ireland, Portugal, etc. ), and U.S. economic data will likely be collapsing through the floor. And don’t forget Illinois, California, and some of our own U.S. PIGS, not to mention the DEBT CEILING issue. The America we have known our entire lives is about to change forever, and either you will be PROTECTED from it, or you will not. This entry was posted on Thursday, June 2nd, 2011 at 9:35 am and is filed under Dollar, Gold, Market Commentary, Ranting Andy, Silver. You can follow any responses to this entry through the RSS 2.0 feed. You can leave a response, or trackback from your own site. a) What do you think will be the impact of the HKMEX trading a gold contract? Are they with or against the CRIMEX? b) What do you think of the following strategy for an individual speculative trader: Join the cartel in their attacks shorting silver at the times and levels we can infer from this analysis. Then use the paper profits generated to buy more physical. a) Ultimately, it doesn’t matter, as it’s all paper. I haven’t seen any changes in trading, and doubt I will anytime soon. It’s the PHYSICAL market that matters, and eventually I believe all metals paper markets may be rendered useless. b) Join the Cartel at your own risk. You’d better be nimble, as we are in a primary (and suppressed) bull market and an explosion upward can happen any time. Andy, it’s been reported that the HKMEX contract is for 1kg physical gold bars, although I personally haven’t seen the contract documents. Andy, A good article that reflects the opinion I have come to have, as a layman,of this as a rigged market. It appears as just one more part of the non-transparent self-serving conspiracy relationship between the political and financial powers that be in the USA. I don’t think it’s quite so bad here in the UK. It’s obvious by the large and sudden price falls out of nowhere in the smaller Silver [which market is therefore more amenable to manipulation]that these are not the simply market price changes as a result of open market transactions. All the pundits are saying that this will come to an end ‘soon’ [especially with silver] as the ‘boys’ will not be able to manipulate against price rises for ever due to the supply situation. But I am an older private investor and it has gone on so long I am wondering if I will ever see a breakout to levels that reflect the true effects of inflation and economic uncertainty. 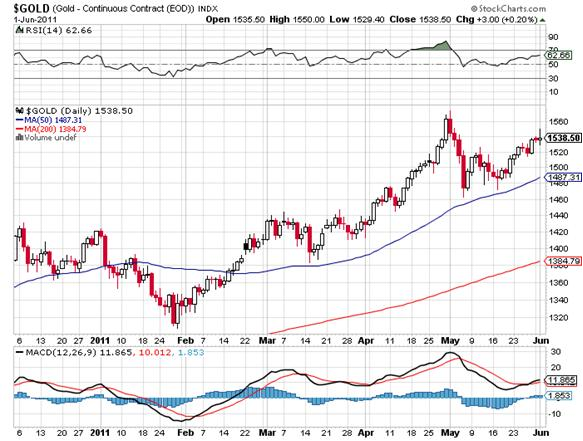 Have you written any articles regarding your view on future timing of the breakout? And do you think the start of silver trading in a Japanese exchange scheduled for this month will undermine the actions of the COMEX gang. I never write about timing, other than that “it” is coming rapidly as the US, ECB, Japan, and UK implode, as well as the U.S. states. And as I wrote earlier, new paper exchanges mean little to me, it’s the PHYSICAL market that matters. I fear you are preaching to the already converted. People who read your “rants” I should image already own a “stash” of “physical”. Your “rants” are a very precise take on what all of us “physical” holders know already and that is that the market (in fact all markets) are corrupt from top to bottom. Governments (in fact all governments) are corrupt from top to bottom. All government agencies that are suppose to protect the man in the street are corrupt from top to bottom. We all gather around websites like yours as camels gather around an oasis. The land surrounding us is one huge corrupt financial desert. Our small “physical holding” band of brothers senses the coming financial earthquake like a flock of birds. Nothing can shake us out of our “physical” and the enemy know this and they are running scared. Agreed George, but the goal of writing is to have it SPREAD via the internet, so as to make the END GAME occur ASAP. Not that I’m looking forward to it, but anything beats the global manipulation of economies and markets by Washington and Wall Street.